Deep Jewels Strawweight Champion Mizuki Inoue successfully retained her title in the Deep Jewels 9 main event tonight in Tokyo, Japan. The talented 21-year-old rebounded from a pair of tough setbacks under the Invicta FC banner by defeating Emi “Kamikaze Angel” Fujino for a third time. 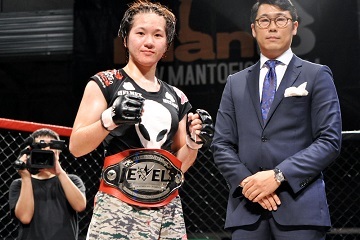 South Korean standout Ji Yeon Kim kept her undefeated record intact and captured her second pro MMA title in tonight’s co-main event. Kim, the reigning Gladiator Women’s Bantamweight Champion, defeated veteran Takayo Hashi in a rematch for the Deep Jewels bantamweight title.